Argent, a saltire between three wolf’s heads erased and a Phrygian cap gules. A portcullis chained argent, semée of ones and zeros sable. The crest I assume is as simple in design as my arms, and contains plain symbolism as well. The symbolism of the portcullis is well established. Sown with ones and zeros, it represents my occupation as a computer security professional. My job is to be a last line of defense in the protection of data. This is taken from the Latin text of Philippians 4:13, which reads in full: “Omnia possum in eo qui me confortat.” I can do all things in Him who strengthens me, and this verse has carried me through many difficult times in my life. When I was in Army Basic Training, this was my go-to verse of scripture. I didn’t know it in Latin back then and I’m no Latin scholar now, but thinking of it that way makes me focus more on the meaning in English. Also, being from the South, I like the “possum” wordplay. A cotton boll slipped and leaved – dimidated with a thistle of their proper colors. I don’t claim this badge as my original art. I pulled SVGs from Wikipedia to create it. As I find time, I will recreate it in a similar minimalist style to my Arms. I also proudly also display the crest badge of the Scottish Clan Douglas. I am a member of the Blackwood Sept of Clan Douglas through my maternal lineage. 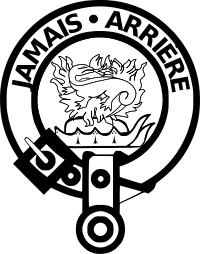 Since my arms are not recorded in the Lyon Register, I do not bear the badge with a silver eagle feather behind it, as is allowed to armigerous clan members. I do not claim copyright to this image.